Sam Allardyce admits Sunderland desperately need Jermain Defoe to overcome a mini-barren spell after just one goal in his last six games. Top scorer Defoe has had chances to add to his 10-goal tally in the last two games, with the 33-year-old spurning a clear-cut one-on-one at former club West Ham last weekend and then firing three shots straight at goalkeeper Wayne Hennessey in Tuesday’s 2-2 draw against Crystal Palace. Ultimately, Defoe’s fellow frontmen got on the scoresheet against Palace, with on-loan Trabzonspor striker Dame N’Doye opening his Sunderland account and Fabio Borini rescuing a point with a stunning last-minute equaliser. But with Defoe the most natural finisher in Sunderland’s ranks, manager Allardyce is well aware of the importance of the England international to the Black Cats’ survival hopes. “We had five shots on target in the first half on Tuesday and the wee man had about three,” said Allardyce. “We just hope that he’s going to get over this barren spell because we need him to. “At least Dame got his first goal to get him underway. “We’ve got to try to score more goals. “We had to rely on a wonder goal from Fabio Borini, which we want to see more of. 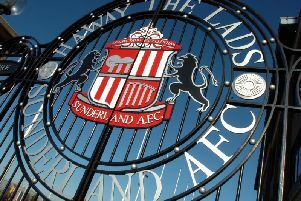 However, the attacking dimension to Sunderland’s play is not Allardyce’s predominant concern, with the Black Cats netting more than any other side in the bottom eight. Sunderland’s inability to keep a clean sheet again cost them against Palace, with the run without a shut-out now standing at 14 Premier League games. After N’Doye had given Sunderland a first half lead, Allardyce admits a 1-0 win would have been the perfect scoreline for him. “Still the ultimate problem is the ultimate problem - we concede too many,” he added. “Until the lads get a grip on themselves and say we’re going to score one goal and win this game with that, then it’ll stay like that. “We haven’t won a game 1-0 since I’ve been here. “When the pressure comes on, that’s what you’ve got to be capable of. “The best result I could have got on Tuesday was a 1-0 because it would have shown we were capable of doing it.